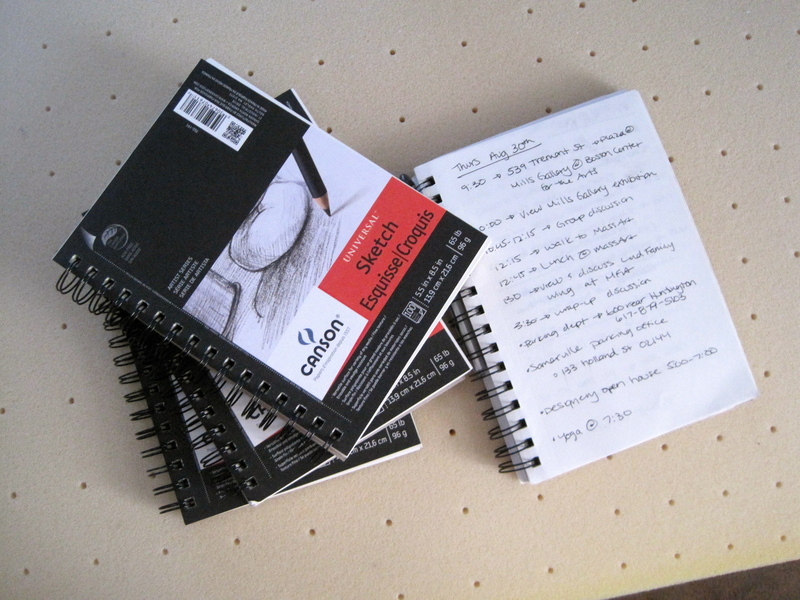 Here are my fresh new sketchbooks alongside one that I currently use for just about everything. Check out my schedule for today – yikes! 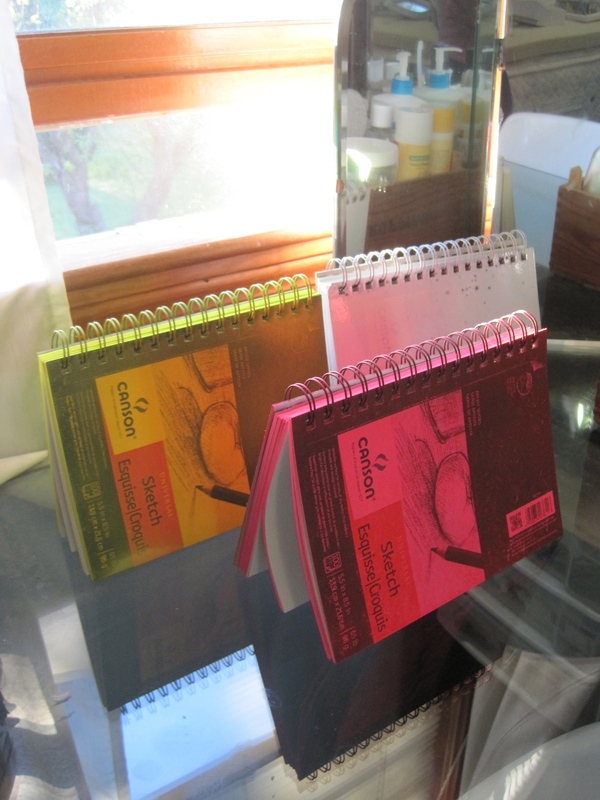 I just laid the sketchbooks down with the covers open and spray painted each one a different color. It took me less than 5 minutes and now I don’t have to worry about grabbing the wrong one. I love the size of these because they fit in almost all of my purses while still being big enough to allow some space for taking notes and drawing out ideas. The paper has a nice weight to it and the spiral is wide enough to accommodate a pen on the inside, keeping them from getting lost so easily! 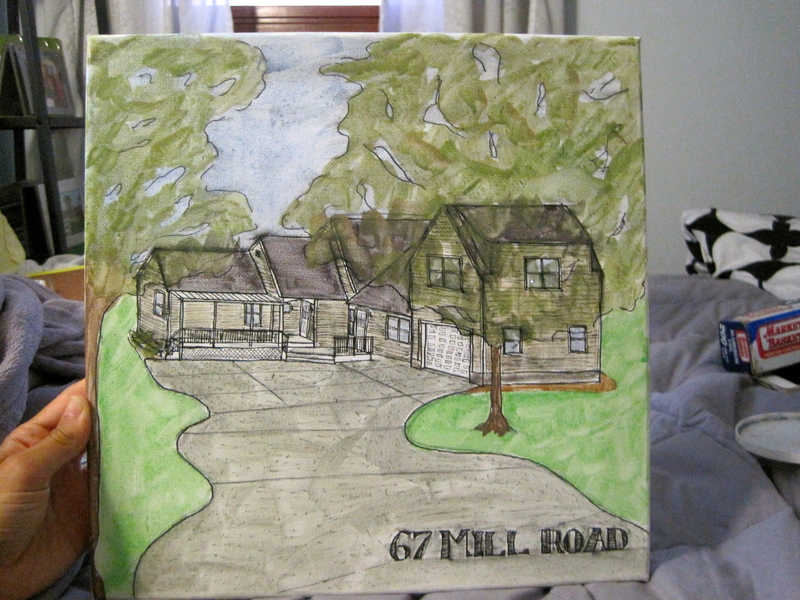 After seeing the house portrait I made back in February, my stepdad requested one of our house. His birthday was a few days ago and I decided it would be a perfect gift for the occasion. The overall technique for this project is the same, but I used acrylic paint on canvas instead of watercolors. I took a bunch of pictures from all different angles to make sure I could see all the details I needed. 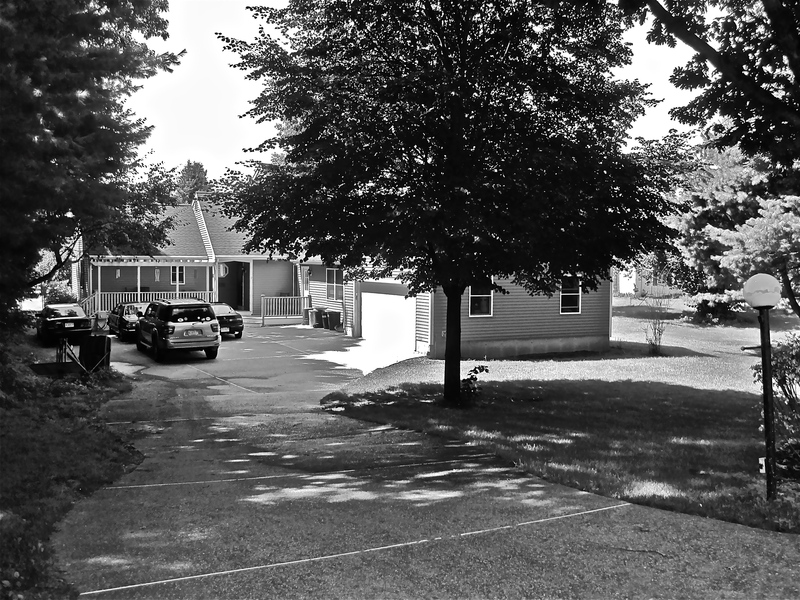 I chose this one for the composition – the rooflines(though hard to make out in this image) have distinct lines and all of the major elements of the facade are visible. I upped the contrast and sharpness to their maximum to make tracing easier. 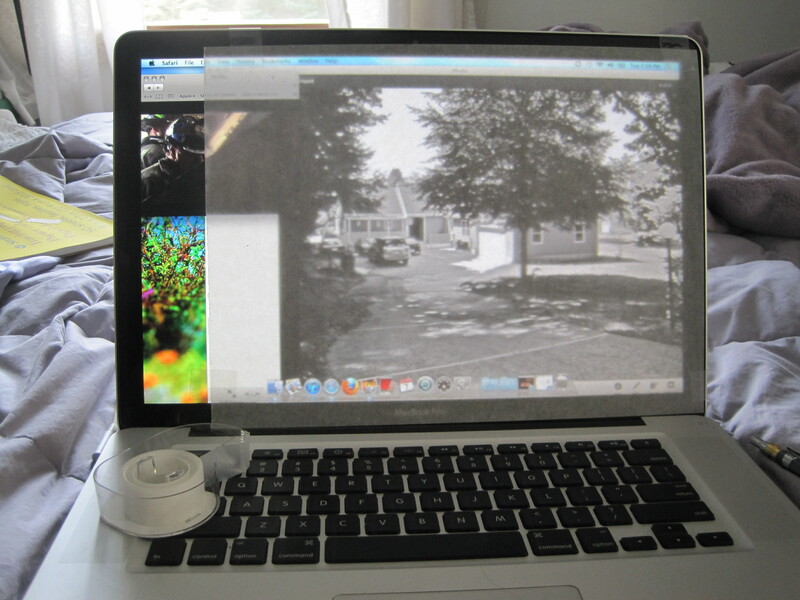 Instead of printing out the image and tracing on a window, I traced directly on my computer screen. 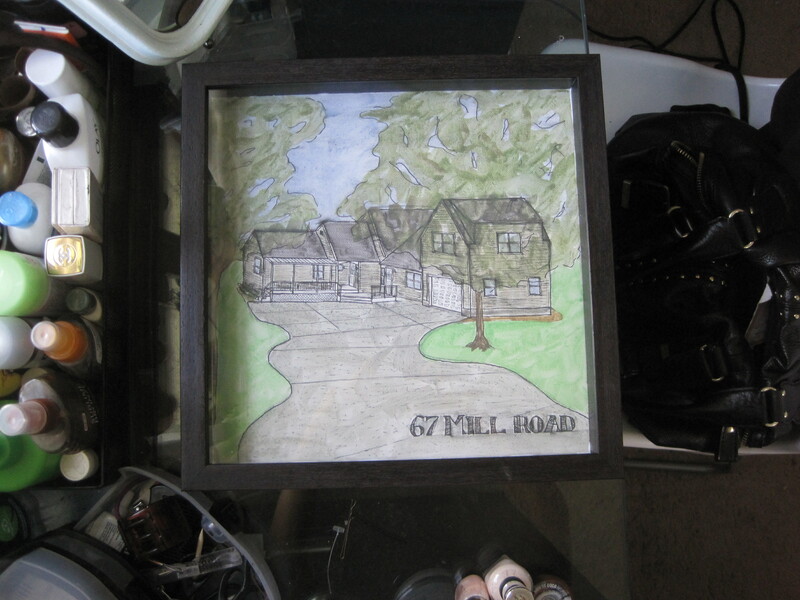 Once everything was traced, I used my printer/copier to blow the image up to fit the 12″ square canvas I had. 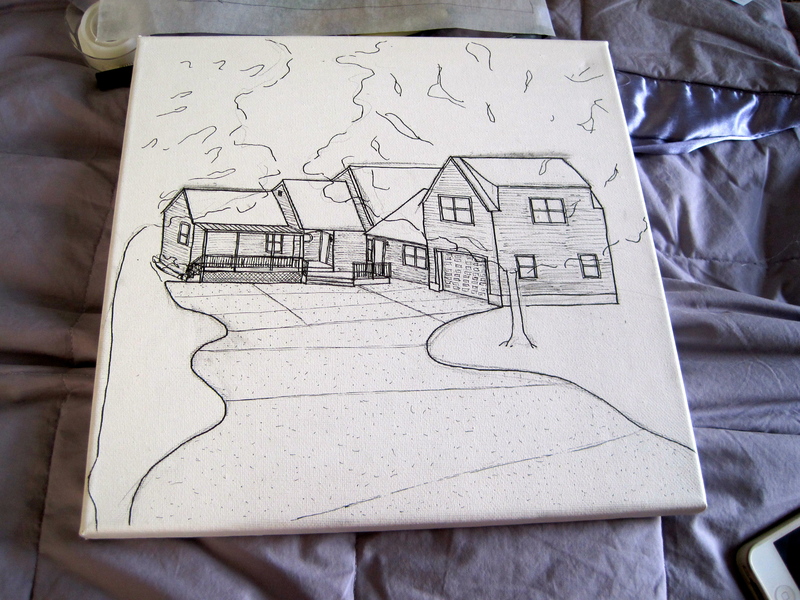 Then I drew the image onto the canvas freehand in pencil. This was small and simple enough for me to just do by hand rather than transfer a mirrored image like last time. Once the image was drawn in pencil, I went back over with pen and added in textural details. 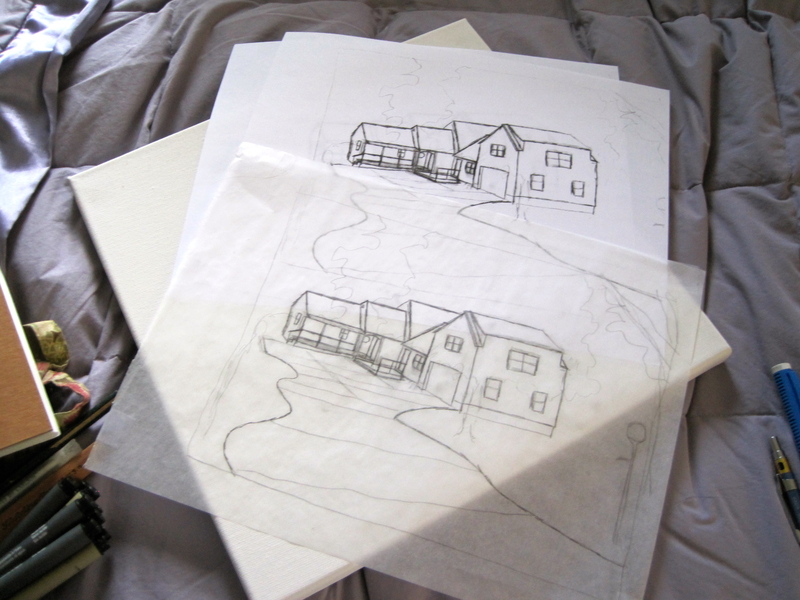 I also decided to keep the trees in the image, but give them a translucent feel so that the house is still the focal point. Using acrylic paints watered down greatly, I started paint from the back forward. So the sky and grass were first, then the house and driveway then the trees. The ink began to bleed a bit because of the watery paint but not enough to blur the image. I found this shadow box frame at Michaels that I thought would allow for the thickness of the canvas inside of the frame. Once I got it home I realized the canvas was just the tiniest bit too large to fit in, so I got to work on making it fit. 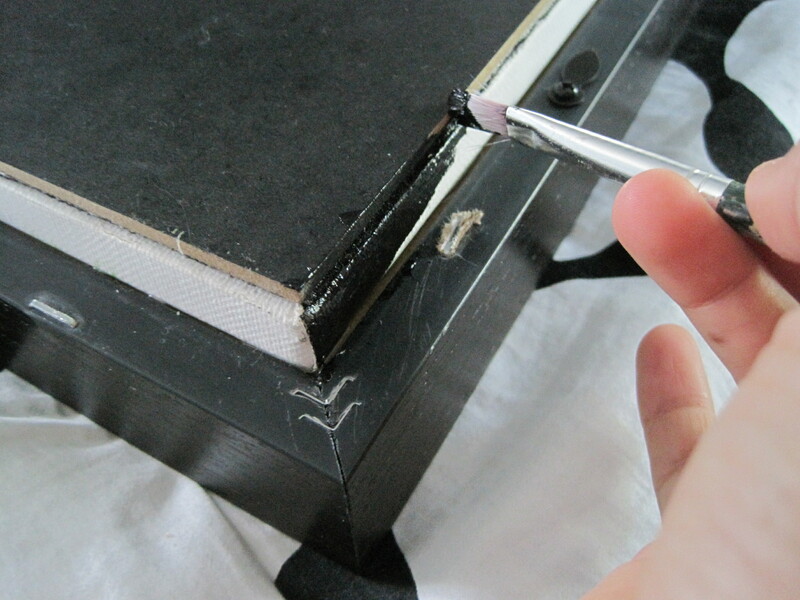 There was a little lip on the inside of the frame that allowed me to glue the canvas to the back, but that meant the bracket to hang the frame would be recessed. So, off came the bracket. 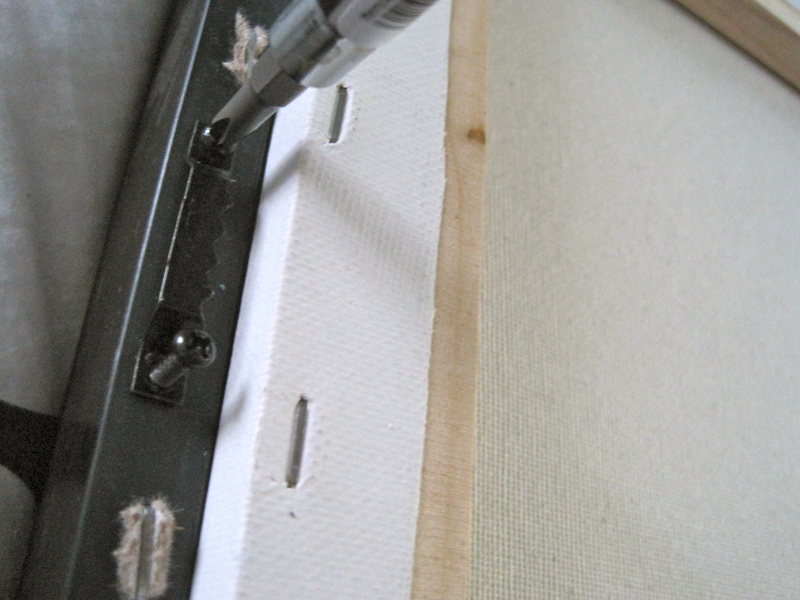 Here is the original backing for the frame, I glued that to the back of the canvas in order to protect the canvas and have somewhere to re-attach the hanging bracket to. I didn’t like that the side of the canvas was showing though, so a quick coat of black paint around the edges fixed that up. Done! 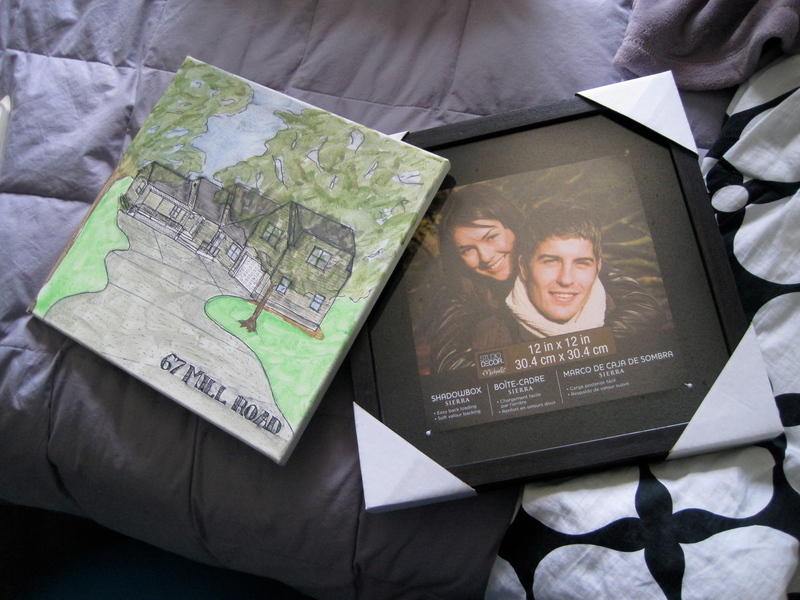 This project took me just a couple hours and since I had everything besides the frame already, cost me less than $10, but gifts like these are thoughtful, personal and always a hit. This now sits prominently on a bureau in my parents’ bedroom. Happy birthday, Mark! 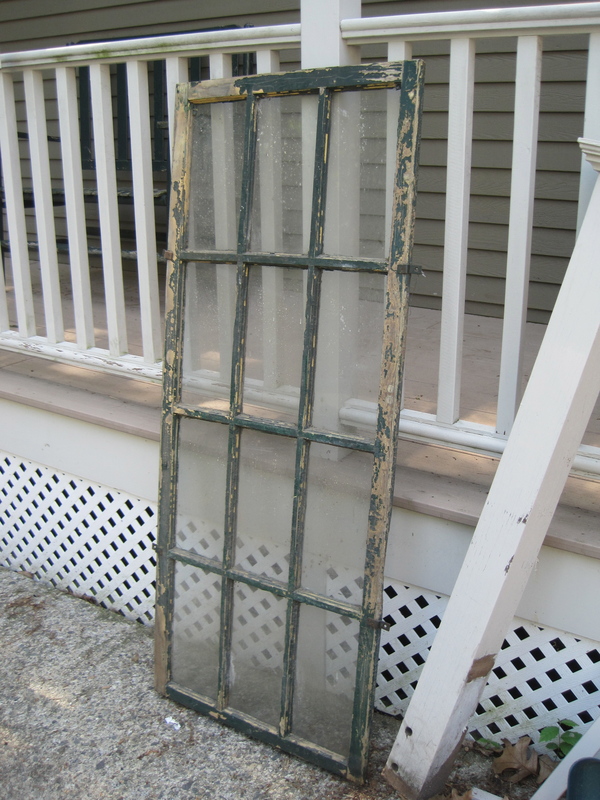 This project sort of just fell into my lap – I came home one day to an old window sitting in my driveway just asking to be repurposed. 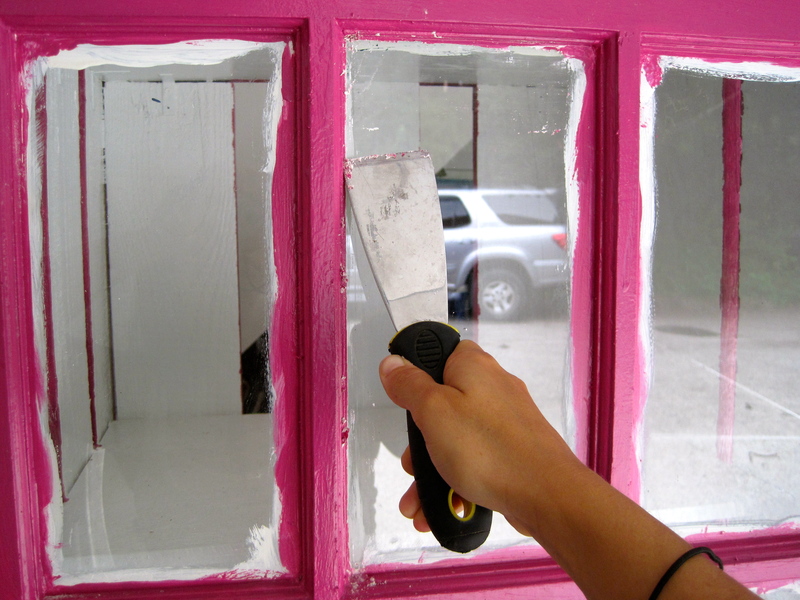 While scraping the old green paint off, I ran through a bunch of ideas in my head of what exactly to do with the window. 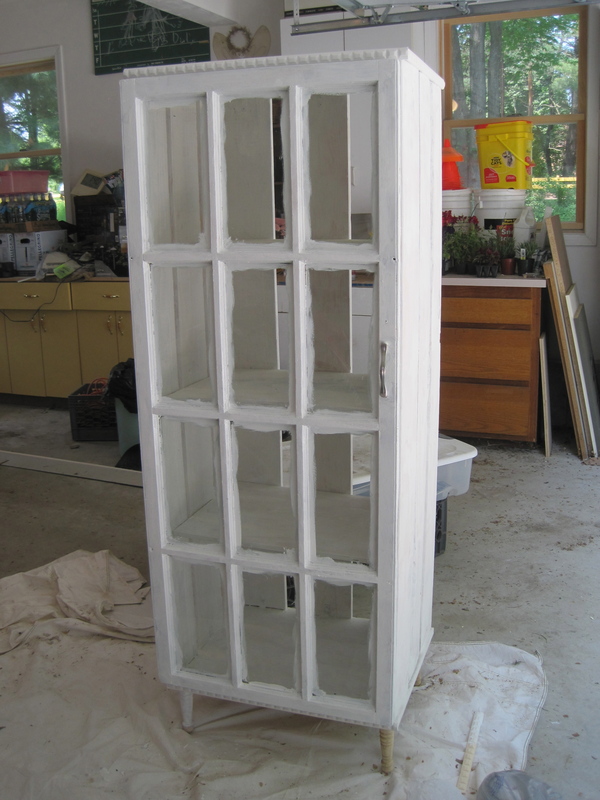 By the time I chipped off as much green paint as possible, I had decided on turning the window into a clothes storage cabinet to replace the last piece of plastic dorm-style chest of drawers I had left. Adulthood here I come! 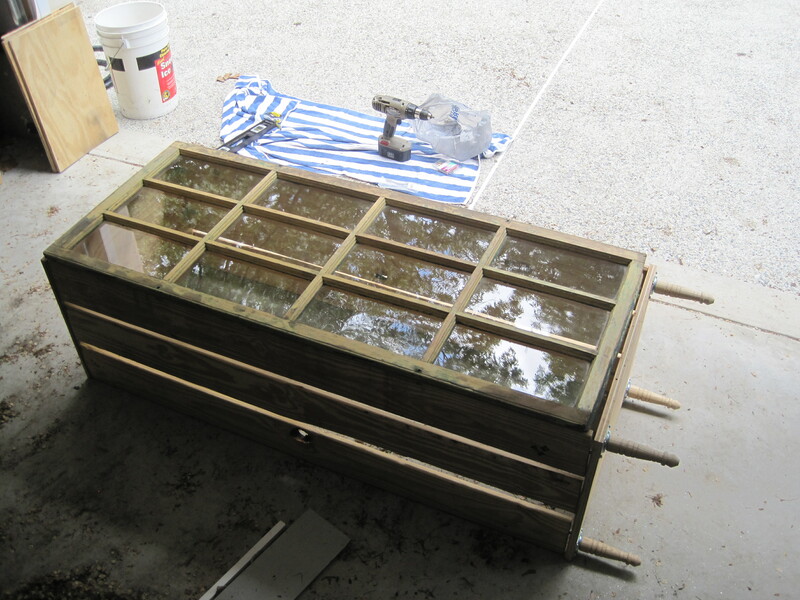 Here’s the window – in rough shape and in need of some crafty loving care. 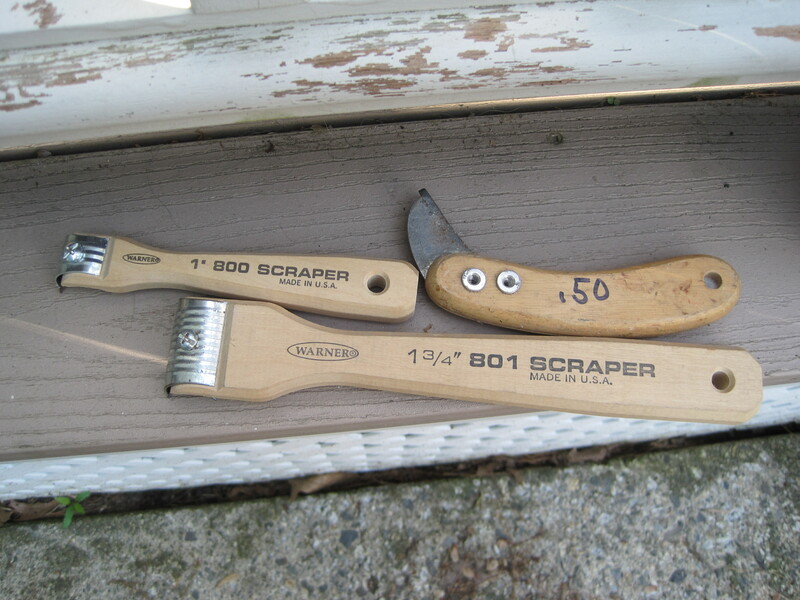 I found these scraping tools among my family’s tool collection, they worked great for the nooks and crannies of the trim around the window panes. 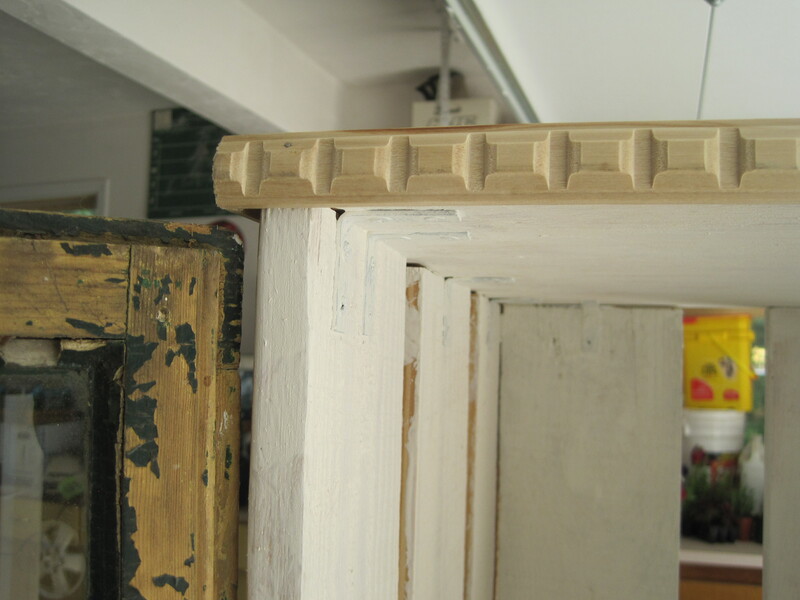 Scraped and sanded, I got to work measuring out the window to come up with a design for the cabinet. 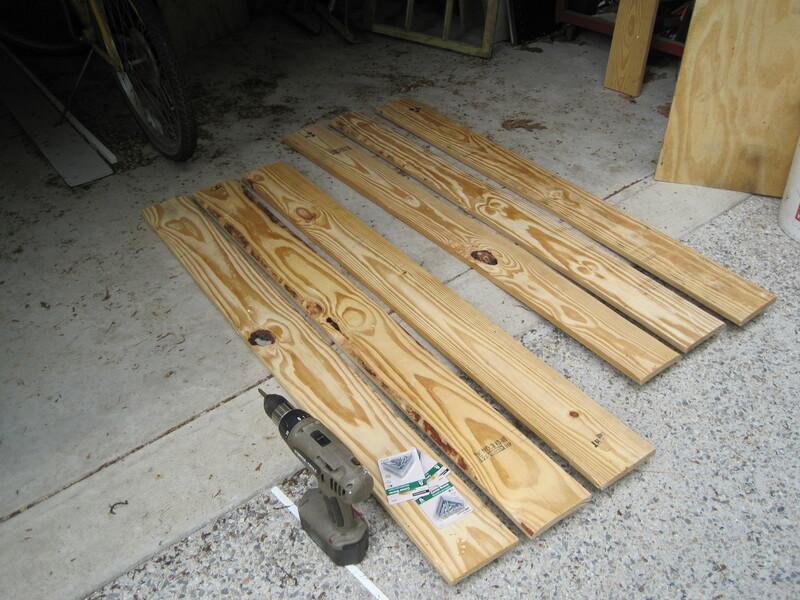 Lucky for me, we had some scrap wood available that was perfect to build the structure of the cabinet with. 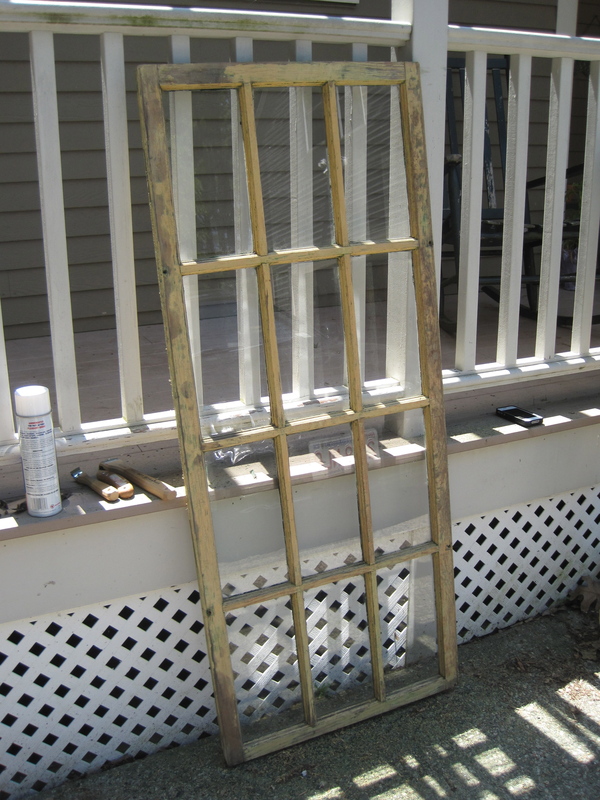 I decided to go with three boards on the two sides and back to mimic the layout of window panes. 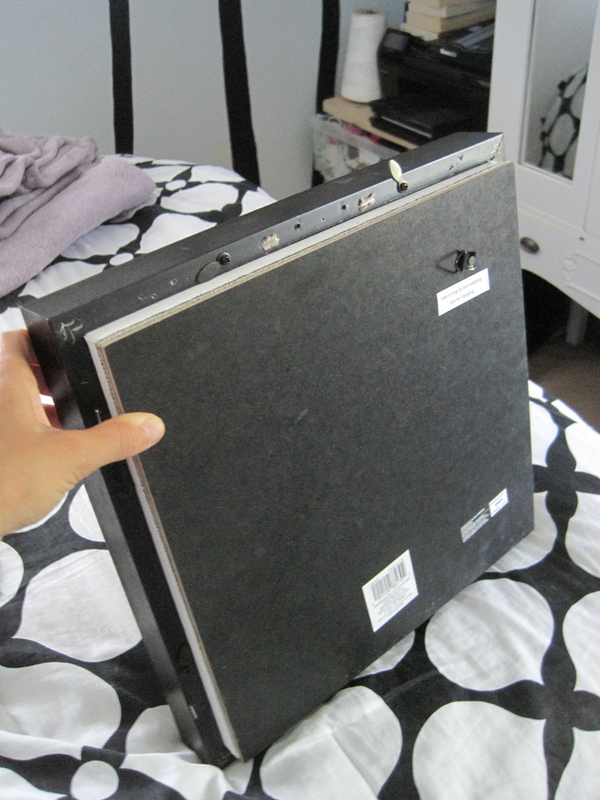 I used small L brackets to attach the sides to the top and bottom. 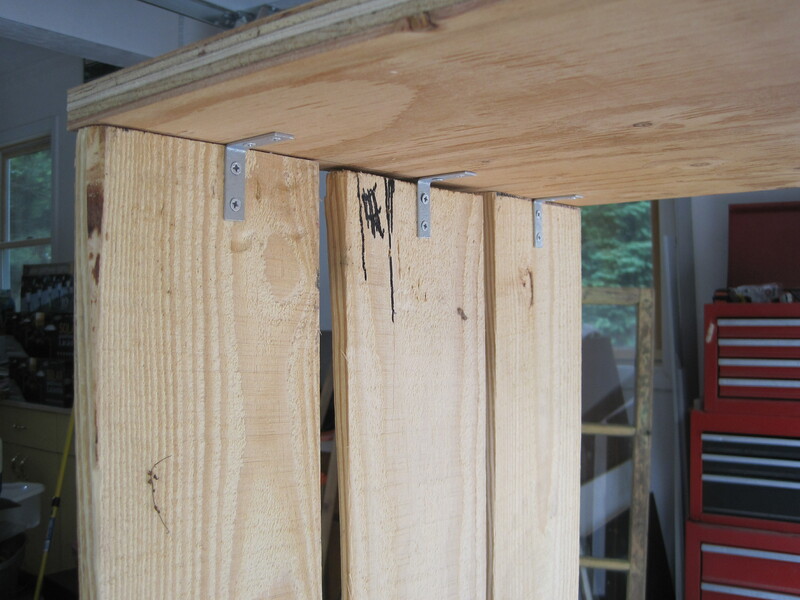 At first it is really flimsy but once the shelves go in, the cabinet becomes very sturdy. 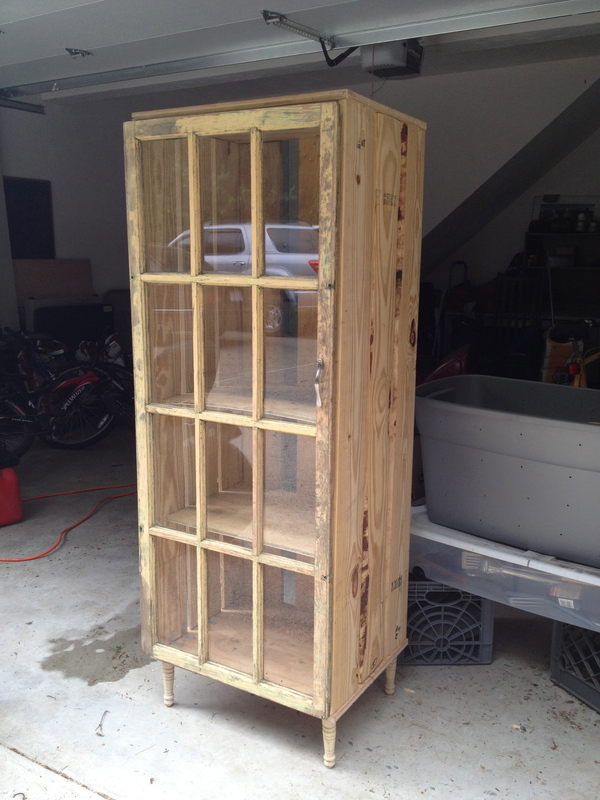 Here is the cabinet with two sides attached. 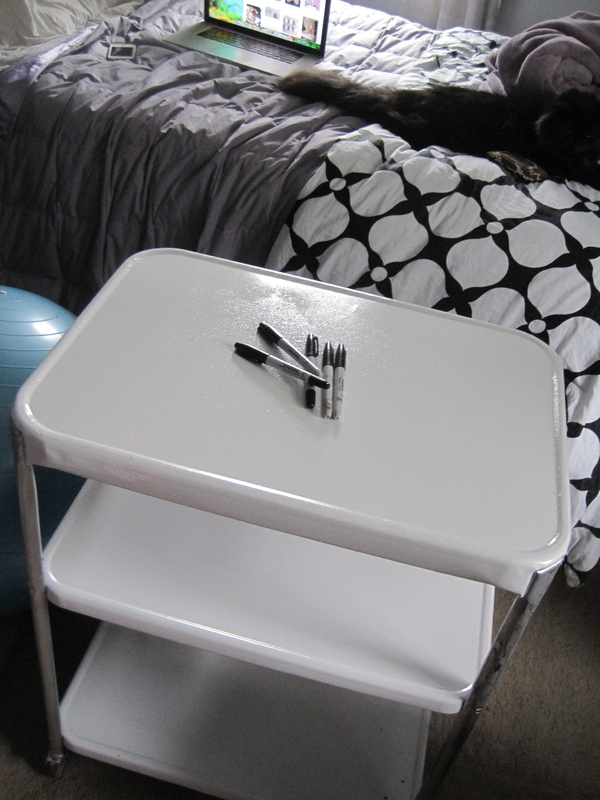 Here you can see the furniture foot attachment. It’s really easy to do and makes it easy to switch out the feet if you ever wanted to. Now time to attach the window! 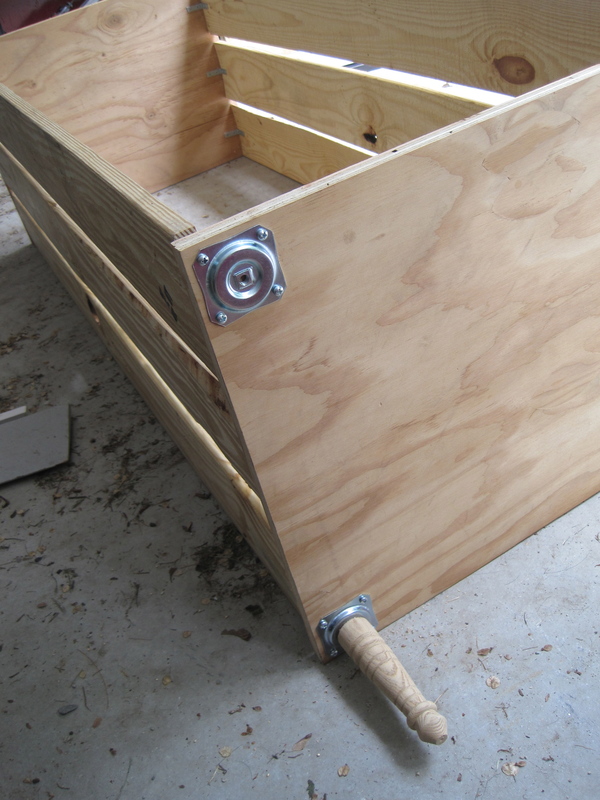 I just used basic hinges and attached them to the inside of the cabinet. I ended up adding an extra L bracket to the top and bottom of the board the window is attached to. This helped to keep the board in place when the window swung open and close. I marked where I wanted the shelves based off of where the horizontal mullions were and drilled holes for the shelf pegs. Once the cabinet was all built, I attached a door handle and a door catch so that the window would stay shut when closed. 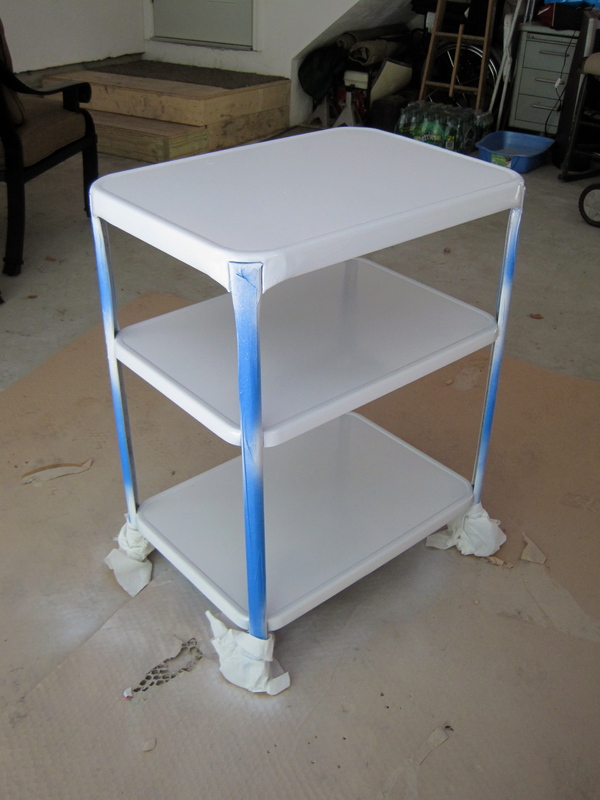 After the cabinet was built, I decided I didn’t like the unfinished look of the top and bottom edges. So I went and picked up some simple decorative trim and attached with some finish nails. Now for the fun part (sort of, haha)! 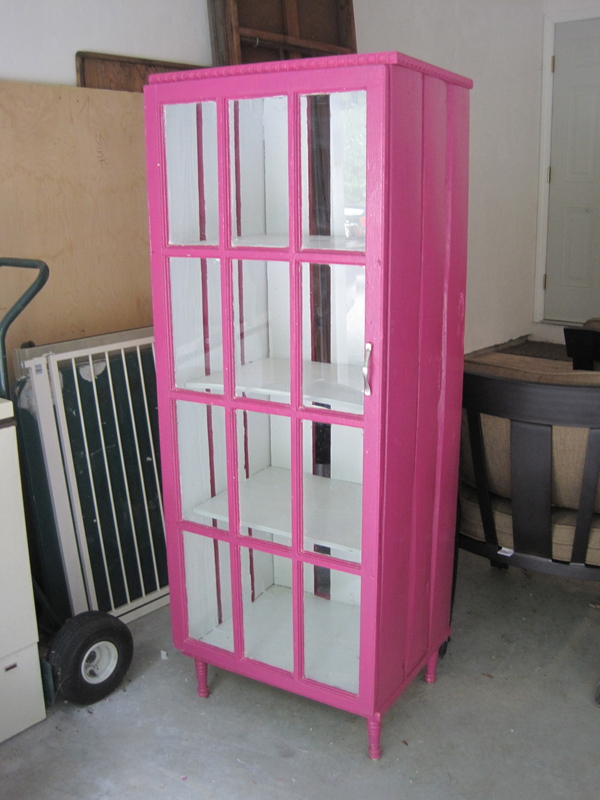 I primed the whole cabinet and didn’t fuss with taping the windows off because I was feeling lazy. 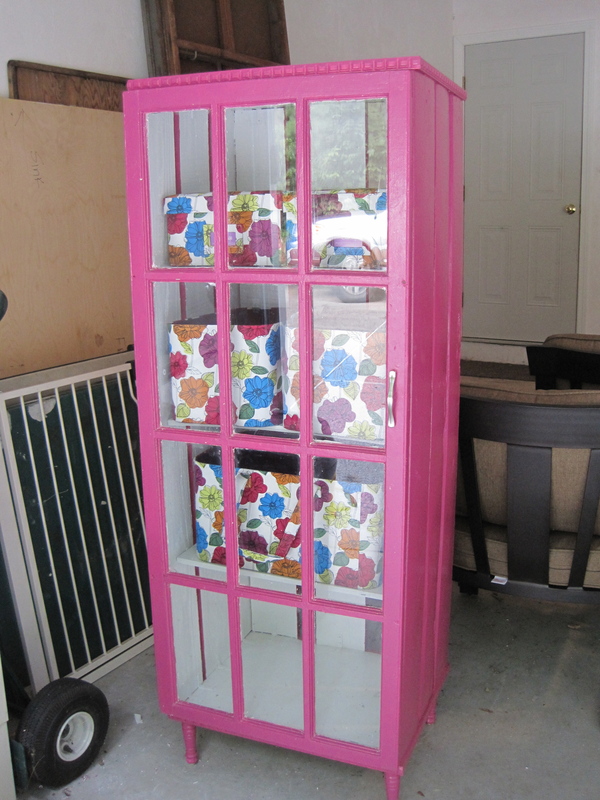 I left the interior a glossy white(surprise, surprise) and painted the exterior a glossy fuschia. I dreaded having the scrape the paint off the windows so maybe tape would’ve been a better idea. Though to get the paint off easily, I sprayed the windows down with Dirtex and let it sit for a few minutes and then took the tool above and just scraped away. 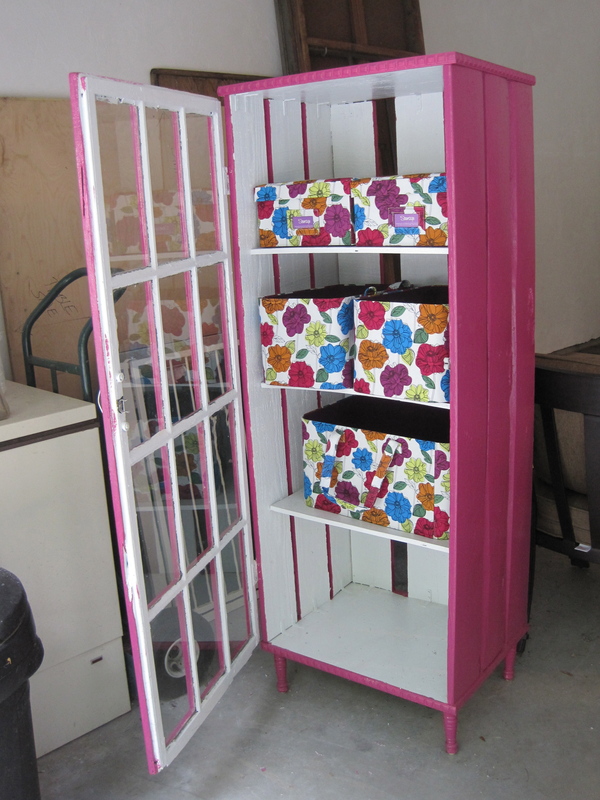 One of my major issues with this project was finding storage bins that I liked and weren’t ridiculously priced. Luckily, I found these bins at Home Goods for a decent price and if in a few years I get sick of them, I can easily just swap them out for a new set. The bottom shelf will be home to my printer, so the gaps between the boards work perfectly for all those cords! I am excited to fill this up and put it to use! 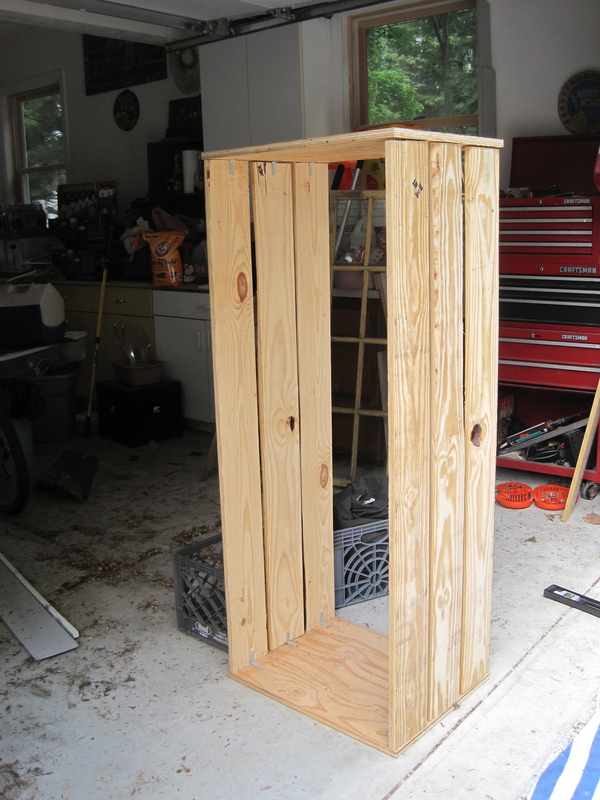 This project should have taken me just a couple days, but other things came up – projects, school, a wedding, so it was spread out over a few months. It was actually nice to work on this in stages, breaking it up into more manageable pieces and not rush through it just to get it done. You guys met the youngest Arnolds child when I made the embellished onesies for Amelia’s first birthday, now here is the oldest of the Arnolds bunch with a project of her own! 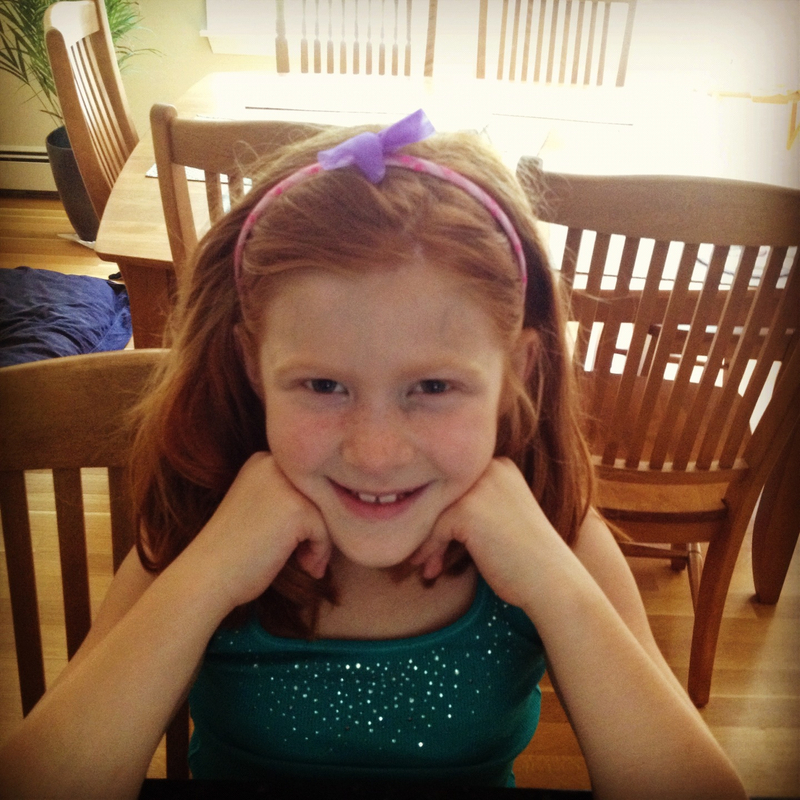 Miss Annabelle is a sassy 7-year-old with a flair for fashion, so I wasn’t surprised when I got a message from my friend Brooke(her nanny) with pictures of some adorable headbands that she made. Annabelle even wrote up her own supply list and project steps for me! Sequins/glitter, anything really, except FOAM! 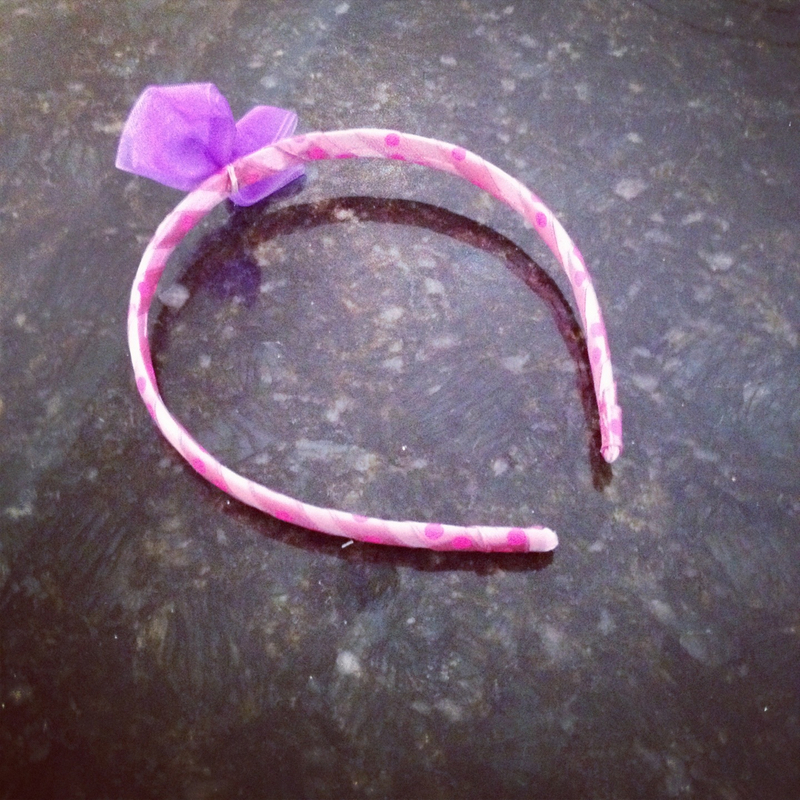 Put glue on the pieces and then stick it on your headband. Any material works. You can wear your headband anytime you want! Annabelle made a few more headbands but had already given them out to family members and friends before I could photograph them, but the one she saved for herself was adorable! You can see where her sister gets her modeling skills from too! As always, keep sending us projects! We love to see what you guys are up to and include you in the blog! First off, welcome to our new home! We had outgrown our humble blogger page and decided that the Two Girls were ready for bigger and better things. Thanks for sticking with us! 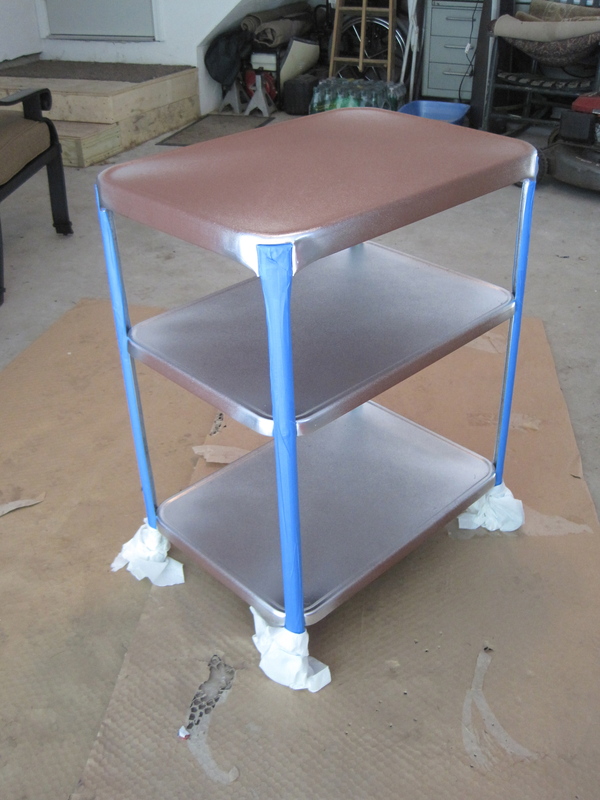 So, during our summer hiatus I have been working on some furniture projects. I am moving next month(yay!) and am quickly realizing that I need more storage options. Lucky for me, our house has been the family dumping ground for unused and unwanted furniture. 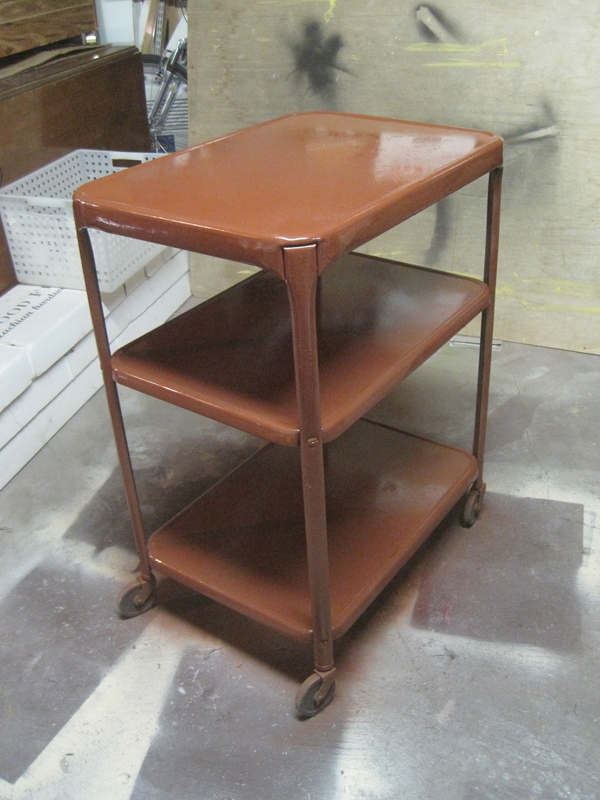 I saw this metal cart and instantly knew it had potential for greatness. This is after I cleaned off years worth of dust and grime. It honestly doesn’t look too bad, and if I were going for the industrial look, this is all I would have had to do. 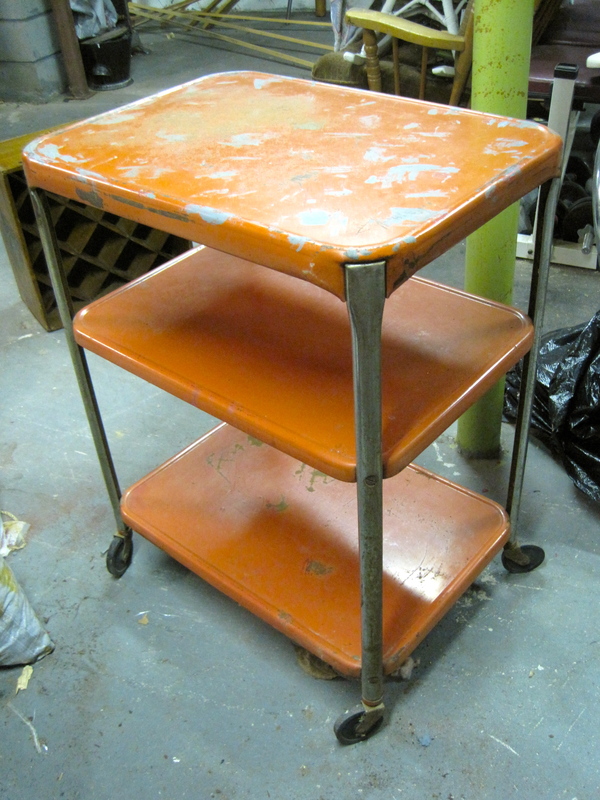 I decided this would probably end up in my bedroom, so a black/white/silver combo would go best. After it was all clean, I sprayed on a heavy duty rust primer just to make sure that none of the rust would bleed through. 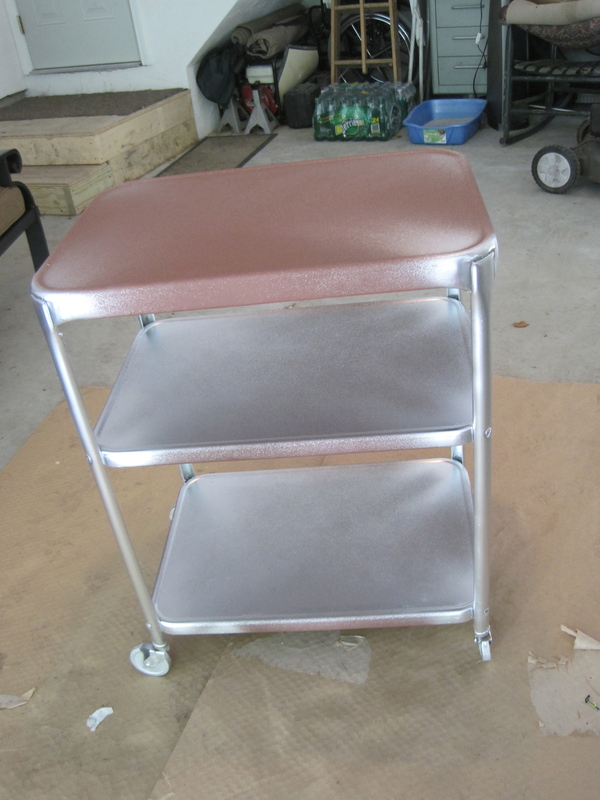 Then I went ahead and repainted the legs chrome silver again. I let the legs dry overnight then taped them off and covered the wheels with paper towels to protect them from the next step. 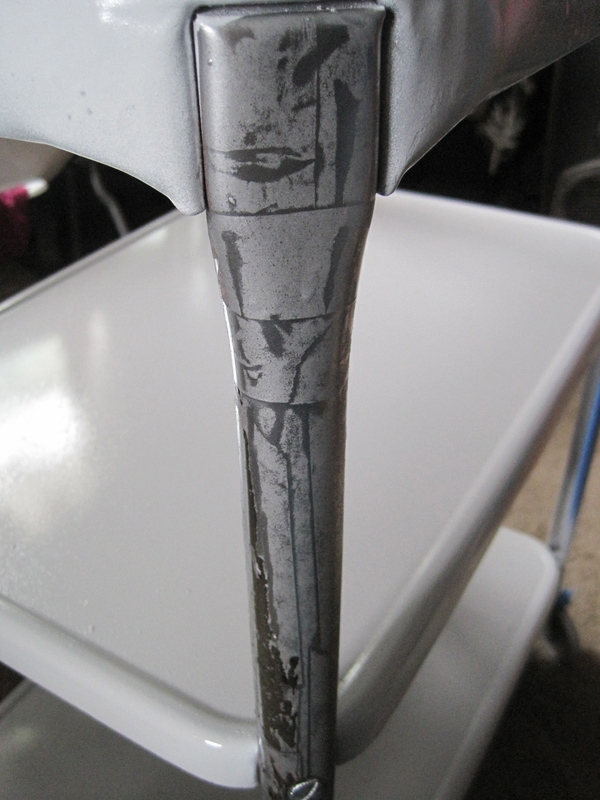 Glossy white paint – I should probably buy stock in this stuff because I use it for everything. So fresh and so clean clean. Now, I went to take off the painters tape and apparently the silver paint wasn’t happy. A lot of the paint came off with the tape and I really don’t know why. I didn’t mind the mix of chrome and matte silver though, so I just rolled with it. Time for the sharpies! I kept a bunch of them out so I could rotate them as they started to wear down or dry out. 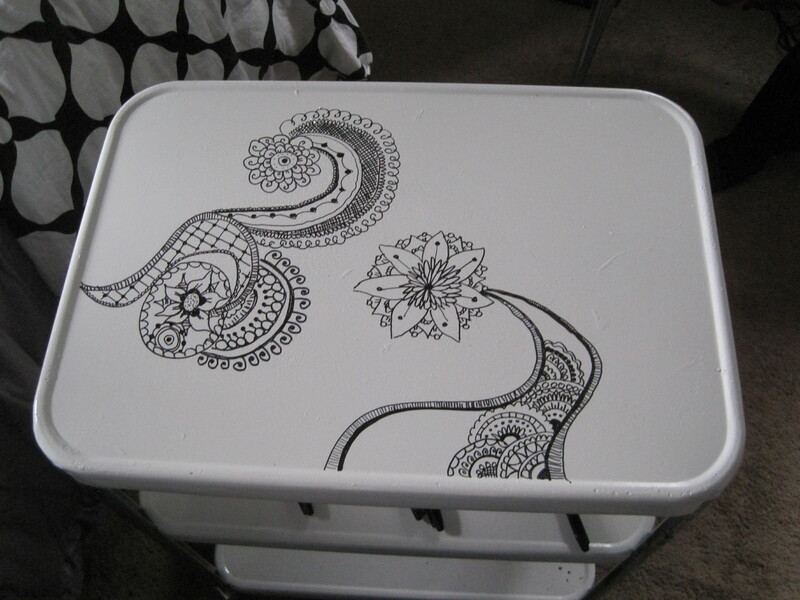 As you can see, I was inspired by floral henna designs with their curvilinear shapes and line patterns. I basically just dove right in and placed the designs wherever , filling in the blanks as I continued drawing. I surprisingly wasn’t much of a doodler in school, but once I got started, it became a bit addictive and I wished I had been doodling my time away during those boring history classes. All covered! I decided not to do the bottom shelves because I figured they wouldn’t be seen at all anyways. 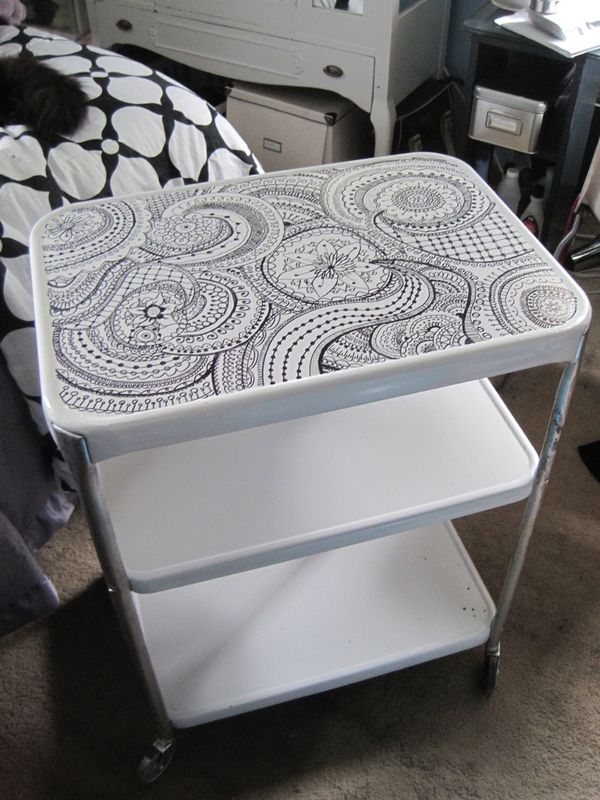 I am so happy with the way this turned out and am pretty excited to incorporate some more doodling into my day.